We have all had those embarrassing moments where we sent off an email to a professor or a potential new job, only to realize a glaring spelling or punctuation error. The kind that makes us sink into our seats.Tools helping us do our work better, smarter and faster — highly valuable, right?! And if it is free – even better. 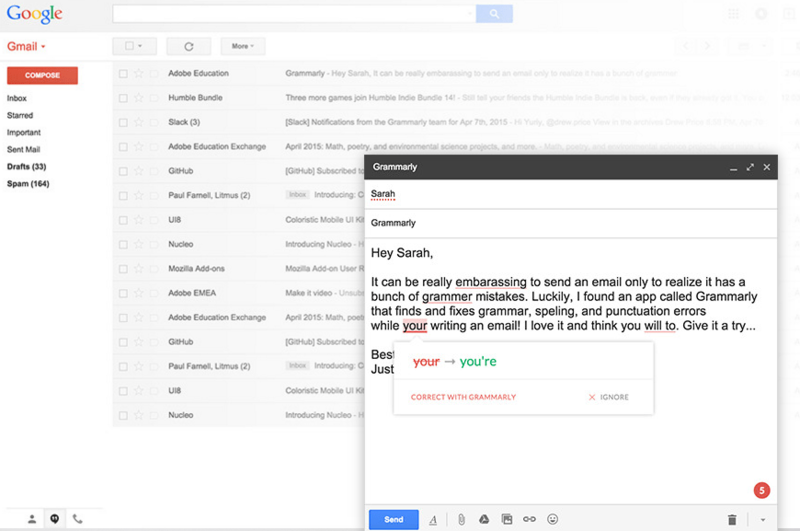 We had the opportunity to review Grammarly, and it is a must for any college student. (Anyone, really.) Hundreds of thousands upon hundreds of thousands of people in over 200 countries use Grammarly, so we decided to check it out for ourselves and give you the lowdown on what we learned. 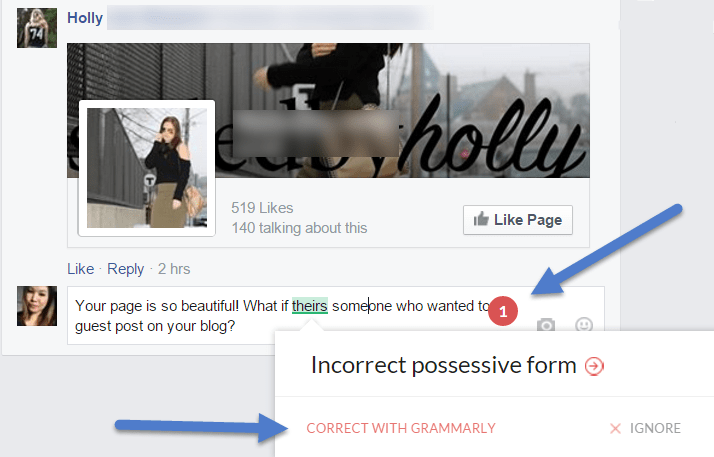 Are you wondering what in the world Grammarly even is? If you guessed it has something to do with grammar, you are correct. It is the best tool for checking spelling and grammar for any document you are writing online, including emails. Update: Grammarly is now available on Windows, Microsoft Office (Windows Only), Mac, Android, and iOS! There is no cost to you. It is like having a personal proofreader living in your computer. There are upgraded subscriptions, but the free version covers most of what the typical college student needs. If you use the free version and love it, look at the tools the additional subscription would give you and decide if it gives you the value you need. 2. It is available as an addon to your toolbar (Chrome, Firefox and Safari) and even on your Gmail! Grammarly works in a couple of ways. You can add it on to your toolbar, creating suggestions as you work online. You can also pop text into the Grammarly online text editor if you are writing offline. It is quick and easy to use, and all you have to do to make any suggested changes is with a click of the button. As college students, a tool helping us improve but quick to implement is a high-value. 3. It will check your email and anything you write online (like Facebook, Tumblr, LinkedIn). Just click on the tools icon and choose what you want Grammarly to be checking as you type. Using their algorithms, it will check over 150 possible issues like spelling, punctuation and grammar issues and grades you to 100%. Goodbye, errors. 4. It provides a plagiarism checker. As a student, it is of utmost importance that the work we turn in is original. It can have a huge impact on a college career to be caught turning in unoriginal content as your own. Sometimes this can happen innocently, so Grammarly compares your work, making sure it is original content. It compares your work against eight billion websites, leaving nothing to chance. 5. It will also help you enhance your word choice and look at contextual spelling errors. English is full of tricky words. Sometimes it is correct to use awhile and other times a while. It is a minute difference between an adverb and a noun. Lose or loose is an easy mistake to make, and not one your regular spell checker will detect because there is no actual spelling error. But how are you supposed to keep track of it all?! This is part of their premium packaging, but it is a great feature! Furthermore, with the premium packaging, it gives you the option of sending it to a proofreader! 6. Universities are using Grammarly. Grammarly is trusted by both students and faculties at a variety of highly reputed schools and institutions (Berkeley, Northwestern, Stanford and the University of Michigan, to name a few). One of the best selling points for us. 7. It is simple to use. If you have an error, it tells you what type of error and how to fix it with only one click. Tools are meant to help us work faster and more efficiently. Grammarly is quick and easy to use, just the way a tool should be. 8. It gives you options. Certain types of writing calls for a different type of editing. Grammarly has a selection tool that allows you to select for the type of writing you are doing such as Academic, Business, Technical or Creative. Overall, we would generally advise you to get Grammarly if you want to focus on that report instead of the minuscule stuff of how to write it. Go get it for free. It’s the best Proofreader we have ever seen! grammarly is a life saver, can’t love it more. We use grammarly as well and just love it. It’s one of those tools you think you’re fine without, until you use it, then it makes you wonder how you got on without it. Such a powerful tool set too that goes beyond just spell check! Great share! I’ve only used Grammarly once. It’s good to read another review on it. What a great feature. It would certainly help to prevent typos and grammar errors. I really like that it offers the plagiarism check. Grammarly was a life saver for me in college! Anytime I had a paper (which was most times) this would be my number one tool before submitting. Thanks for your review. I’ve been reading about his app, and I think I should try as well and see if it works with me. I did not know about that extension. It is great! Especially to someone who’s english is not thefirst language! and it is free! I have used Grammarly a lot over the years and really love it! I didn’t realize they had an extension – going to check that out now! I am obsessed with it! It is a major life saver!